Tooth loss has a negative impact on oral health and the way a person looks, smiles and bites. Replacing missing teeth with dental implants has helped many patients regain their oral function and have improved confidence in the way they look and feel. 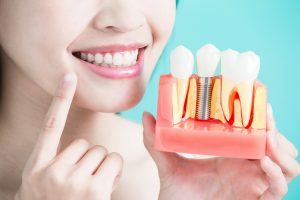 Dental implants in Milton Keynes have been used consistently by dental practices such as Northlight Dental to replace single or multiple missing teeth. These small, titanium, screw-shaped posts are surgically inserted into the jawbone and act as artificial tooth roots, stimulating the growth of new bone tissue in and around them. Dental implants look and feel so natural, that onlookers won’t be able to tell that patients are sporting artificial teeth. Dental implants in Milton Keynes can replace a single tooth, several teeth or an entire arch of missing teeth. Replacement teeth can either be fixed permanently in a patient’s mouth, namely implant-supported crowns and bridges, or they can be made removable for cleaning with implant-supported dentures. In the latter case, the replacement teeth do not require a plate that covers the roof of the mouth to remain secure, enabling the patient to fully taste and enjoy their food. Implant-supported dentures can also be permanently fixed in place if preferred. Although dental implants are appropriate for many people, those who are the best candidates for this treatment have good oral and overall health. If gum disease is present, it should be resolved before implant surgery. Other conditions such as heart disease and diabetes should also be brought under control before implant surgery. Last but not least, the density and quality of the jawbone is a decisive factor for successful dental implant treatment. However, techniques are available to rebuild degenerated jawbones prior to implant surgery. To find out more about the numerous benefits of dental implants, book an appointment with an implant dentist in Milton Keynes.